See cover page for all warnings, disclaimers and author's notes. New Calendar: Day 354, Year 2 A.E. Mulder once looked at me and asked when I had known him to be wrong. Of course, the question was meant as a joke at the time. I could have wished him to be less correct on a variety of subjects since then. Since I’ve bullied him into finally writing down his personal thoughts about the events we experienced, it was only fair that I do the same. These are only our personal thoughts; naturally, we've kept more detailed and official reports of the events as they were happening. Who knows what history will remember from these times; I can only hope it is as accurate and as fact-filled as possible. But time and experience have taught me the more realistic and expedient probability of history being rewritten by the needs of the future. In any event, all we can do is offer our truth, such as it is. It is up to those of the future to grasp it. As has been my personal mission statement right from the beginning of my career in the old Federal Bureau of Investigation, my life has been dedicated to the preservation of rational and scientific evaluation; to use the tools of the scientist to evaluate any phenomenon we might come into contact with. To understand the mechanisms by which these things operate and exist. To examine the previously unexamined and make it understood in our world through the medium of science. I had thought myself to be a rational, level-headed individual. I believed myself to be enough of a scientist to face the unknown fearlessly, to look it in the eye and demand that it explain itself to me. I certainly learned otherwise over the past decades. My complacent assumption in my own ability to fearlessly face down whatever might come was naïvely based upon an erroneous assumption that all things I discovered would fit nicely into my own world view. 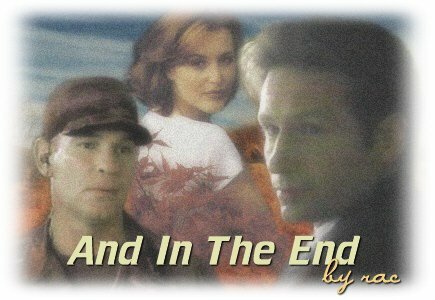 Time and my association with Mulder and the old X-Files certainly whittled away at my error. What in my childhood or upbringing instilled such automatic terror as to induce automatic and complete denial when faced with certain things? Certainly not the Catholic church I was raised in, nor either of my parents, nor the environment I grew up within. As a Navy family, we traveled far and wide, and I was exposed to a variety of cultures and lifestyles in our neighbors. As a young Catholic girl, the mysteries of Mass only created a kind of questioning wonder about how everything worked. True faith was something I developed only when I was much older. As for my parents, neither were fearful individuals. On the contrary; they were certainly not responsible for passing along to me any unconscious, unreasoning fears. It took me years to be able to admit this: My missing time prior to finding the implant in my neck was not the first time I’d been taken. As a child, still growing up in an era of relative innocence, my brothers and I had a great deal of freedom to roam at will: around the military bases where we lived, in the small towns we sometimes moved to. There were infinite times I might have been truly missing, and no one would have been the wiser. How easy it would have been; how much the idea explains things to me now. I remember back before the collapse, when Mulder and I first were involved with Gibson Praise. Too many things happened at that point in time, things I didn’t want to see and didn’t want to deal with. Gibson was one of them; Gibson, with his perfect telepathy, his perfect sixth sense. It terrified me. I recall at one point having to walk away, walk out of the building where he was, because I could not face the reality of it without the threat that facing it would tear me apart. I couldn’t fit him into my scientific world view; there was no acceptable slot. Now, of course, I understand my old terror. In those days, my own natural psi abilities, while mostly dormant or unconscious, were strong; but what had effected me most were the times I’d been taken, when the aliens communicated telepathically. My terror imprinted itself upon that kind of experience, and afterward, anything that smacked of the same kind of unexplained phenomenon caused unreasoning fear in me. I can’t help but wonder about how things worked out, about my assignment with the X-Files. What were the chances that I would come into contact with such strange and bizarre situations in any other (normal) assignment I might have drawn? That synchronicity—even if it wasn’t synchronicity, but contrived machinations by the Consortium and Spender—is just one of the many things that fueled my faith in something greater, some God-force that infuses the world with its purpose. Then how would I explain this latest, horrific world-wide disaster, you might ask? I counter it with the question, how would one explain the World Wars? Or any other atrocity that mankind visits upon his own kind? I have my own explanations, derived from my theological beliefs; everyone else must come to their own conclusions. My conclusions and personal beliefs were hard won. I struggled for many years against the inevitable before I surrendered. By that time, I had no choice—reality was staring me in the face. There was too much evidence, too many things that added up to only a narrow conclusion. In a way, it was a relief; I’d blamed Mulder too long for what were my own problems. The tension and strain between us had escalated to uncomfortable proportions, and later, I fully accepted the blame for it. Aliens were walking among us. It was fact. Their technology, their biology…the trail was there for all to see. But I and others couldn’t let ourselves believe—until it was almost too late. Those who sought to delude us had laid a convincing path of breadcrumbs for years, toward more traditionally acceptable routes of explanation. But Mulder…once Mulder’s genetic pattern was triggered and he began to ‘evolve’, once I couldn’t walk away, once the biological evidence was in my hands and I began to truly understand what we were dealing with…the earth tilted beneath my feet. For 24 hours, I was literally disoriented. North was no longer north, the sun no longer rose in the east, and I could no longer deny or suppress the things that were in my own mind. I believe it was the sudden “explosion” of the many unconscious memories into my conscious mind that effected me in such an intense and traumatic manner. When I woke up hospitalized the next day, after the police had found me wandering and unable to communicate clearly, I knew I would never be the same again. That was yet one more day that the Consortium and their doings robbed from me. It would be the last. From that day, I was freed of the fears of the past. Within that freedom, my own natural abilities began to unfold—due, I believe, to proximity to Mulder and his own, but that is only my own theory. I have no proof to support it. In short order, a small host of selected scientists and specialists handpicked from within and without the FBI worked with me for a solid week on the information that Mulder had gleaned using his new “insight”. Without Skinner’s bold authorization to proceed, we never would have been able to move forward so quickly. Our work bore fruit. At last, we had all the proof needed: a complete uncovering of the Consortium’s collusion with the alien plan to take over the planet. After years of being ridiculed, laughed at, and denigrated by his co-workers and his superiors, Mulder stood before a secret, packed meeting of the upper echelons: Senators, Congressmen, Justice, FBI—he called them all. And a pin could have been heard being dropped in that room by the time we were done. He and I both knew it; it was all over except for the shouting (which did follow). When the President of the United States was called, we knew we’d won. Within a week, task forces were formed to investigate numerous tentacles of the “plan”, from the contaminated bees and crops, to the genetic testing and research. Every lead was followed up. The Secretary General of the United Nations was closeted with the President for most of one day, and the following day, Mulder and I were shuffled off to the White House by Secret Service agents for a private briefing on the situation. From there, I suppose, the leaders of other countries were informed and brought into the loop, because within days, our internal task forces were given foreign counterparts to coordinate efforts with. Certainly, it would do no good to eradicate the problem in one country, while it flourished elsewhere. Needless to say, Tunisia was our first area of focus abroad; their Prime Minister was reportedly appalled, and cooperated to the fullest extent. We experienced a level of international cooperation during this period unlike anything that had ever happened before in recorded history. It was…to be honest, I felt euphoric during this time, that’s the only way I can describe it. Despite all the tension, despite the very real threat, I was at peace with myself in a way I’d never been before. I could see order within the chaos. Then the reactor in China was sabotaged, and another one in Eastern Europe, within days of each other. The United States closed its borders and scrambled to DEFCON one within 24 hours, but it was too late. Such precautions were woefully and ignorantly inadequate. Within fifteen hours of our alert to DEFCON one, a nuclear reactor on the shore of the Chesapeake Bay at Calvert Cliffs, Maryland, was thoroughly and completely sabotaged. Full meltdown occurred in all cores. The containment structures were destroyed through strategically placed explosives. All scram fail-safes were off-line and dysfunctional. In short, it was a ruthlessly effective job. Calvert Cliffs was turned into a nuclear bomb. Calvert Cliffs is located about 50 miles from Washington, D.C. It was yet another twist of fate that saved us. Mulder and I were out west, personally investigating a Consortium site that had recently been discovered. My mother was not away from home. On that fateful day, October 23, 2004, she was at her home in the Northern Virginia suburbs of Washington. The last time I had spoken to her, just days before, she had been looking forward to going out with a new man she’d met, a retired Army officer. She had sounded happy. Once you read of the past, those of you in the future might begin to understand how the changes happened so quickly in those days of chaos. Necessity demanded it. A world in extremity demanded it. There was nothing to do but answer the call, as best we could, and pray it might be enough. And in the small, dark hours of the night, we remembered our dead.